For subcutaneous injection in beef and non-lactating dairy cattle only. Not for use in female dairy cattle 20 months of age or older or in calves to be processed for veal. Zuprevo™18% is a ready-to-use sterile injectable solution containing tildipirosin, a semi-synthetic macrolide antibiotic. Each mL of Zuprevo™18% contains 180 mg of tildipirosin as the free base, 82.5 mg citric acid monohydrate and 400 mg propylene glycol, and water qs with citric acid monohydrate added to adjust pH. 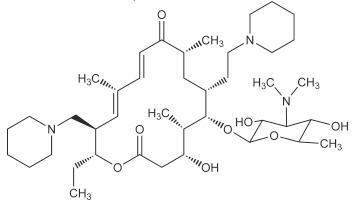 Tildipirosin is the nonproprietary name for (11E,13E)-(4R,5S,6S,7R,9R,15R,16R)-6-(4-Dimethylamino-3,5-dihydroxy-6-methyl-tetrahydro-pyran-2-yloxy)-16-ethyl-4-hydroxy-5,9,13-trimethyl-7-(2-piperidin-1-yl-ethyl)-15-piperidin-1-ylmethyl-oxacyclohexadeca-11,13-diene-2,10-dione. The empirical formula is C41H71N3O8. The chemical structure of tildipirosin is shown below. Zuprevo™18% is indicated for the treatment of bovine respiratory disease (BRD) associated with Mannheimia haemolytica, Pasteurella multocida, and Histophilus somni in beef and and non-lactating dairy cattle, and for the control of respiratory disease in beef and non-lactating dairy cattle at high risk of developing BRD associated with Mannheimia haemolytica, Pasteurella multocida, and Histophilus somni. Inject subcutaneously as a single dose in the neck at a dosage of 4 mg/kg (1 mL/100 lb) body weight (BW). Do not inject more than 10 mL per injection site. Do not puncture the stopper of the respective vial size more than the tested number of punctures, shown in Table 1. FOR USE IN ANIMALS ONLY. NOT FOR HUMAN USE. KEEP OUT OF REACH OF CHILDREN. TO AVOID ACCIDENTAL INJECTION, DO NOT USE IN AUTOMATICALLY POWERED SYRINGES WHICH HAVE NO ADDITIONAL PROTECTION SYSTEM. IN CASE OF HUMAN INJECTION, SEEK MEDICAL ADVICE IMMEDIATELY AND SHOW THE PACKAGE INSERT OR LABEL TO THE PHYSICIAN. Avoid direct contact with skin and eyes. If accidental eye exposure occurs, rinse eyes with clean water. If accidental skin exposure occurs, wash the skin immediately with soap and water. Tildipirosin may cause sensitization by skin contact. For technical assistance or to report a suspected adverse reaction, call: 1-800-219-9286. For customer service or to request a Material Safety Data Sheet (MSDS), call: 1-800-211-3573. For additional Zuprevo™18% information go to www.zuprevo.com. For a complete listing of adverse reactions for Zuprevo™18% reported to CVM see: http://www.fda.gov/AnimalVeterinary/SafetyHealth. DO NOT USE ZUPREVO 18% IN SWINE. Fatal adverse events have been reported following the use of tildipirosin in swine. NOT FOR USE IN CHICKENS OR TURKEYS. Cattle intended for human consumption must not be slaughtered within 21 days of the last treatment. Do not use in female dairy cattle 20 months of age or older. Use of this drug product in these cattle may cause milk residues. A withdrawal period has not been established in pre-ruminating calves. Do not use in calves to be processed for veal. The effects of Zuprevo™18% on bovine reproductive performance, pregnancy and lactation have not been determined. Swelling and inflammation, which may be severe, may be seen at the injection site after administration. Subcutaneous injection may result in local tissue reactions which persist beyond the slaughter withdrawal period. This may result in trim loss of edible tissue at slaughter. Similar to other macrolides, tildipirosin inhibits essential bacterial protein biosynthesis with selective binding to ribosomal subunits in a bacteriostatic and time-dependent manner. Tildipirosin may be bactericidal against certain isolates of Mannheimia haemolytica and Pasteurella multocida. Table 2 Summary of pharmacokinetic characterization of tildipirosin administered subcutaneously to calves at a dose of 4 mg/kg BW. Value based on 8 animals that were slaughtered at 504 hr post-treatment. Tildipirosin concentrations in bronchial fluid collected in vivo from non-anesthetized cattle reflect the bacterial exposure to drug concentrations at the site of action. Nightingale, C.H. (1997) Pharmacokinetics and pharmacodynamics of newer macrolides. The Pediatric Infectious Disease Journal, 16, 438-443. Tildipirosin has shown in vitro and in vivo antibacterial activity against the bacteria Mannheimia haemolytica, Pasteurella multocida, and Histophilus somni, three pathogens associated with bovine respiratory disease (BRD). The minimum inhibitory concentrations (MICs) of tildipirosin against the indicated BRD pathogens were determined using the methods described in the M31-A2 standard of the Clinical and Laboratory Standards Institute (CLSI) and are shown in Table 4. The MICs of tildipirosin were determined for isolates of Mannheimia haemolytica, Pasteurella multocida, and Histophilus somni obtained from two BRD field studies. In both studies, tested isolates of M. haemolytica and P. multocida were obtained from nasopharyngeal swabs taken prior to treatment from all study animals. Tested isolates of H. somni were obtained from nasopharyngeal swabs taken prior to treatment from all study animals and from nasopharyngeal swabs taken from saline-treated animals classified as treatment failures. Table 4 Tildipirosin minimum inhibitory concentration (MIC) values* of indicated pathogens isolated from BRD field studies in the U.S. The correlation between in vitro susceptibility data and clinical effectiveness is unknown. The lowest MIC to encompass 50% and 90% of the most susceptible isolates, respectively. In a multi-location field study, calves with naturally occurring BRD were treated with tildipirosin. The treatment success rate of the tildipirosin-treated group was compared to the treatment success rate in the saline-treated control group. A treatment success was defined as a calf not designated as a treatment failure from Day 1 to 13 and with normal attitude, normal respiration, and a rectal temperature of < 104°F on Day 14. The treatment success rate was significantly higher (p = 0.003) for the tildipirosintreated group (229/300, 76%) compared to the saline-treated control group (96/200, 32%). There were no BRD-related deaths in the tildipirosin-treated group compared to a 7% (21/300) BRD-related mortality rate in the saline-treated group. In another multi-location field study, calves at high risk for developing BRD were administered tildipirosin. The treatment success rate of the tildipirosin-treated group was compared to the treatment success rate in the saline-treated control group. A treatment success was defined as a calf not designated as a treatment failure based on clinical respiratory and attitude scoring and, if necessary, rectal temperature measurement of < 104°F through the end of the study (Day 14). The treatment success rate was significantly higher (p = 0.0001) for the tildipirosin-treated group (305/386, 79%) compared to the saline-treated group (197/387, 51%). There were three BRD-related deaths during the study (one tildipirosin-treated calf and two saline treated calves). A target animal safety study was conducted using Zuprevo™18% administered in 5-month-old cattle as three subcutaneous doses of 4, 12, or 20 mg/kg BW given 7 days apart (1×, 3×, and 5× the labeled dose). Animals remained clinically healthy during the study at the labeled dose. Injection site swelling and inflammation, initially severe in some animals, was observed that persisted to the last day of observation (21 days after injection). No other drug-related lesions were observed macroscopically or microscopically at the labeled dose. A separate injection site tolerance study was conducted using Zuprevo™18% in 5- to 9-month-old cattle administered as a single subcutaneous injection of 10 mL. Injection site swelling and inflammation, initially severe in some animals, was observed that persisted to the last day of observation (35 days after injection). No other drug-related clinical signs were observed. Do not store above 30°C (86°F). Do not freeze. The maximum storage time after first puncture is 28 days at or below 25°C (77°F). Zuprevo™18% is supplied in 50, 100 and 250 mL, amber glass, sterile, multi-dose vials. Copyright © 2011, Intervet Inc., a subsidiary of Merck & Co.
TO BE PROCESSED FOR VEAL. by or on the order of a licensed veterinarian.